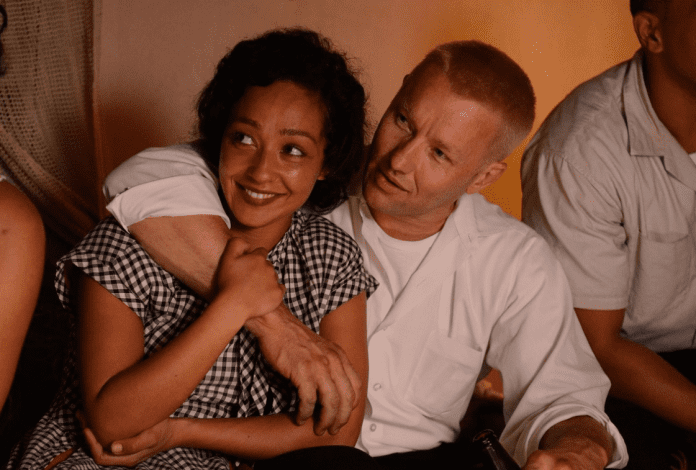 Mildred Jeter (Ruth Negga) and Richard Loving (Joel Edgerton) committed a crime just by falling in love when they were in the bloom of youth back in 1958. That’s because she was black and he was white, and they were living in Virginia, one of the many Southern states with anti-miscegnation laws still on the books forbidding cohabitation, marriage, procreation or even sexual relations across racial lines. Nevertheless, Richard was so smitten he proposed and, after Mildred accepted, he purchased a vacant plot of land where he promised to build their dream home. However, when it came to time to wed, they had to travel north to Washington, DC, a city where they could secure a marriage license. Upon returning to their tiny hometown of Central Point, they were promptly arrested during a nighttime raid staged by policemen tipped off about the recent nuptials. They charged the couple with violating section 20-58 of Virginia’s Racial Integrity Act, a felony punishable with up to five years in prison. The Lovings were ultimately convicted, but fled to the District of Columbia rather than serve their sentences, especially since Mildred was expecting their first child by then. What a tragedy it was for them not only to be fugitives of justice, but to be forced to start their family in a strange big city, when they already had a place to live, if it weren’t for state-sanctioned racial intolerance. Five years later, their plight came to the attention of Bernie Cohen (Nick Kroll) and Phil Hirshkop (Jon Bass) attorneys with the American Civil Liberties Union (ACLU). The lawyers talked Mildred and Richard into lending their names as plaintiffs in a suit challenging the Constitutionality of Virginia’s longstanding statute prohibiting interracial marriage. The beleaguered couple agreed, and the appellate process worked its way up to the U.S. Supreme Court which agreed to hear the case. “Tell the judge I love my wife,” Richard implored the ACLU legal team preparing the oral argument. On June 12, 1967, the Court announced that it had arrived at a unanimous decision written by Chief Justice Earl Warren. He declared that Virginia had violated the Lovings’ rights to both Equal Protection and Due Process as guaranteed by the 14th Amendment. Directed by Jeff Nichols (Mud), Loving carefully chronicles the life and times of an unassuming couple reluctantly thrust into the national limelight by a landmark legal case. The production features an Oscar-nominated performance by Ruth Negga opposite Joel Edgerton. Together, the two generate a quiet, yet convincing screen chemistry portraying Mildred and Richard as modest working-class heroes. A poignant period piece about a pair of practically-saintly role models well-deserving of their iconic status in the annals of American jurisprudence. Blu-ray/DVD Combo Pack Extras: Making Loving; A Loving Ensemble; Loving v. Virginia; Virginia: A Loving Backdrop; and feature commentary with writer/director Jeff Nichols.